Naturally low in fat and rich in protein. 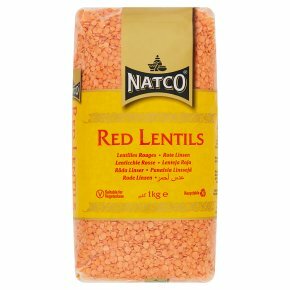 Suitable for vegetarians.Red lentils Perfect for dals, soups, stews and casseroles. Red Lentil Soup Serves 4 Ingredients 150g Natco Red Lentils; 1 carrot, sliced; 1 celery stalk, sliced; 1 onion, chopped; 2 garlic cloves, crushed; 3cm ginger, grated; 1/2 tsp Natco Paprika; 1.1 ltr vegetable stock; 3 tbsp olive oil. Method Heat the olive oil in a large saucepan, add the onion, carrot and celery and fry until softened. Add the garlic and ginger and fry until the garlic has softened. Stir in the paprika, then add the lentils and stir well. Add the stock, bring to the boil and simmer for 20 mins until the lentils are tender. Serve topped with a drizzle of olive oil and some chopped coriander. Rinse lentils thoroughly and drain (no need to soak). Cover with fresh water, bring to the boil and simmer for 15-20 mins until tender.Caution: Do not eat raw.